Standing facing the Flywheel end of the engine, Bank 1 is located on the right hand side of the engine, there are two sensors one upstream, on the engine side of the catalytic converter, and one down stream on the exhaust side of the catalytic converter. Bank 1 Sensor 2 is the Downstream sensor for this side of the engine. 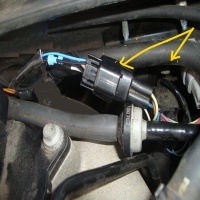 Bank 1 sensor 2, measures the residue oxygen content of the exhaust gasses as they exit the catalytic converter, this is used by the ECU to diagnose the overall effency of the combustion process and as part of the OBDII system it's measurement signal will be used to help identify combustion problems within the system. The connector for Bank 1, Sensor 2 is located toward the rear of the engine bay on the bulkhead. It is fairly easy to access. 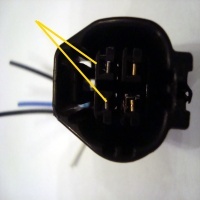 Bank 1, Sensor 2 is the Black connector, to remove the sensor release the connector and sperate from the plug. The sensor can be accessed from the drivers side (UK Car) but is fairly tight to get your arm in you can not access from under the car. You will need a special tool 22mm socket 50mm deep with a slot down it, to remove and replace the sensor. The ratio of fuel to air in the combustion chamber is identified with the Greek letter 'lambda' hence the term 'lambda sensor' as the name given to the O2 sensors used in vehicles. Ideal combustion of gasoline occurs when the fuel : air ratio is 14.7:1 (fuel is 6.8% of the mass of the mixture) at this point the lambda value of 1.0 is assumed. As the lambda value drops the fuel:air mixture is becoming richer (less air more fuel) and conversely as the value rises the mixture is becoming weaker (more air to fuel). With the engine up-to normal working temperature, check the output of the sensor wire, normally black with Zirconia sensors, you should expect an output of 0.2 – 0.8 volts fluctuating between these reading approximately 2 – 3 times per second. If the output voltage is lower than this, i.e. 0 – 0.2 volts there will be a lean running or excess oxygen problem. If the voltage is higher than this, i.e. 0.8 – 1.2 volts then there will be a rich running or excess fuel fault.